I came across an interesting idea when I searched for recent renewable energy articles. Photosynthesis is a miracle of evolution. Being able to convert sunlight into food is the basis for almost all life on this planet. However, photosynthesis is incredibly inefficient. Only about 3% of the energy hitting the plant is turned into glucose. Photovoltaic panels, on the other hand, are 5 times more efficient. This poses a potential problem. 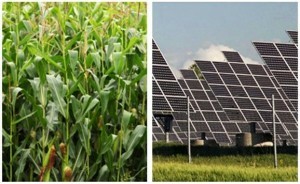 What if, as the price of PV cells comes down, it becomes more lucrative to have a solar energy farm than one with crops? We would lose our means of survival. A doomsday scenario would follow and the world would fall into chaos. Perhaps that was a little dramatic. But this is a serious question. How can we balance agriculture and energy to meet both our energy and food needs? Earth’s population is still growing and food demand is expected to increase 39% by 2050. http://www.card.iastate.edu/iowa_ag_review/summer_08/article4.aspx. Global energy demand is likely to increase even faster, 49% by 2035. http://205.254.135.24/oiaf/ieo/highlights.html. How will the Earth be able to provide this demand? A recent study may have found the answer. Researchers at the University of Miami call it an agrivoltaic system. Their idea is to include plants and PV cells on the same plot of land. This will hopefully maximize land productivity, while still allowing both resources to be harvested. They created models and tested to see how productive the land would be. Their results showed a surprising “35-73% increase of global land productivity” for two different densities of PV panels (Dupraz). This could well be the future of farms. 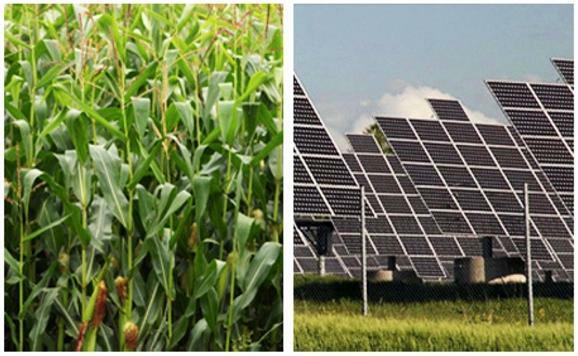 It is clear that more research needs to be done about the best ratio of crops to panels and if the infrastructure required to have energy production will interfere with harvesting crops. It is, at the very least, an intriguing idea.